According to Harvard Medical School, cutting out or reducing red meat consumption can help prolong your life by up to 20%. The study, published in the Archives of Internal Medicine, looked at 84,000 women and 38,000 men’s diets in order to determine if it was really beneficial to consume a big juicy steak several times a week. The study found, unequivocally, that people who ate the most red meat (especially processed red meats) died younger, and most often from cardiovascular diseases and cancer. Even though people who consumed high levels of red meat also tended to smoke, drink, and have less-than-healthy body weights, those factors were calculated into the study, and people who ate more red meat still died sooner than their more vegetarian counterparts. 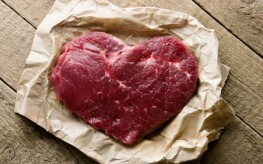 The study concluded that each daily serving of red meat increased risk of death by 13%. The impact rose to 20% if the serving was processed, as in food items like hot dogs, bacon, and cold cuts. “This study provides clear evidence that regular consumption of red meat, especially processed meat, contributes substantially to premature death,” according to Dr. Frank Hu, one of the senior scientists involved in the study and a professor of nutrition at the Harvard School of Public Health. The good news is that you don’t have to go completely meat free, though. You can substitute other proteins that the body can more easily assimilate and digest. Fish resulted in a 7% decrease in risk, beans and legumes resulted in a 10% decrease in risk, chicken and whole grains resulted in a 14% reduction, and nuts as a source of protein offered a whopping 19% reduction in cardiovascular and cancer risks compared to red meat consumption. The study did not measure sprouted beans or other sprouted seeds that often have up to 900% more nutritional value for the body as well. Furthermore, many farm-raised animals which supply meat are fed on GMO diets, which can cause cancer, organ failure and other unsavory health concerns. The study was funded by grants from the NIH and by a career development award from the National Heart, Lung, and Blood Institute. The study authors reported that they had no conflicts of interest. "The study was funded by grants from the NIH and by a career development award from the National Heart, Lung, and Blood Institute. The study authors reported that they had no conflicts of interest." Really? Why is Natural Society giving this study any credence by publishing it? Is this an example of vegetarians supporting the establishment line when it fits their protocol? My issue with these studies is that it doesn't specify the quality of the red meat. Yes, cows raised in CAFOs (confined animal feeding operations), fed grains, in a cramped environment, pumped with antibiotics and hormones is definitely going to increase your risk of multiple diseases. However, I'd like to see a study done on 100% grass-fed and grass-finished beef. Grass-fed meat has a much better ratio of omega-3 EFA (2 or 3:1 vs 20:1), CLA (anti-cancer fighting nutrient), balanced ratio of saturated fat (yes, sat fat is GOOD for us in the right ratios), and much higher levels of all other nutrients. Give me a study that says that grass-fed meat will increase my risk of death and I will definitely lay off of it. Until then, grass-fed steak IS for dinner! Screw Harvard. I'll die young enjoying my steak. As with most nutrition research, they will reverse their findings about 8 years from now. I would like to see a study done on the consumption of organic grass fed red meat. It would be interesting to see if we get the same results. And with people who did not "also tended to smoke, drink, and have less-than-healthy body weights."